Hi friends! Rebecca here from Make & Do Studio! You may remember me from Petite Party Studio, but I have ventured off on my own. Now I’m back to share a bunch of fun and easy DIY projects with you. From DIY decor to projects that will make your next party POP, I will be stopping by to give you the how-to for some pretty amazing DIYs. 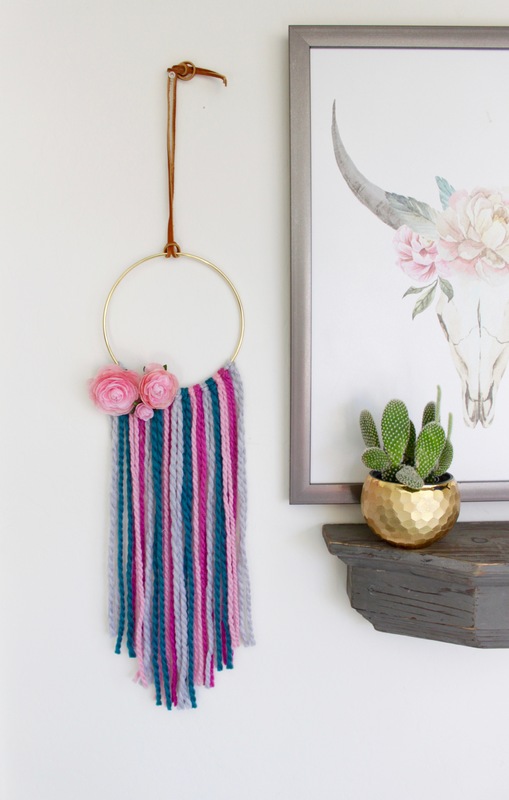 Today I am sharing this super cute, on trend boho wall hoop that is the perfect complement to your little’s nursery, upgraded bedroom or playroom! If you can use scissors, you can make these super trendy decorative hoops in just a few short steps. For this smaller hoop I cut 28″ pieces of yarn to double up in a simple loop. Once doubled, the length is approximately 14″. Don’t worry this part doesn’t have to be exact since you will trim the ends in the end. I alternated colors, but here is where you can let your creativity run wild! I used four colors and placed them in a repeating pattern. I used seventeen pieces total. I finished the end with an extra piece of gray just to balance it out. I opted for leather lacing to hang my hoop up with, using the same loop that I used earlier for the yarn to secure it to the hoop. For the final touch, I hot glued some faux ranunculus to the left side for added color and dimension. There are endless ways to finish off the bottom; for this particular one, I cut the yarn in 1″ steps. I’m telling you the design possibilities are endless—add more flowers, braid your yarn or even throw some beads onto the yarn. Take it over the top or keep it simple. No matter what the end result, this hoop wall hanging will be totally hip and fun to make! See other takes on the modern boho wall hanging trend below.